I’m breaking my Saturday morning ritual to write this at 9am. The farmers markets opened three weeks ago and my Saturday morning routine for the last three weeks has been precisely: wake up, get an iced coffee (which I will proceed to spill on my new white shoes), go to the farmers market, scour for any remaining bunches of lilacs of the season, buy all the ruby red stalks of rhubarb, eat ham and cheese crêpes, and repeat. I go to the market without any idea of what I am going to buy but the market is never short of inspiration. 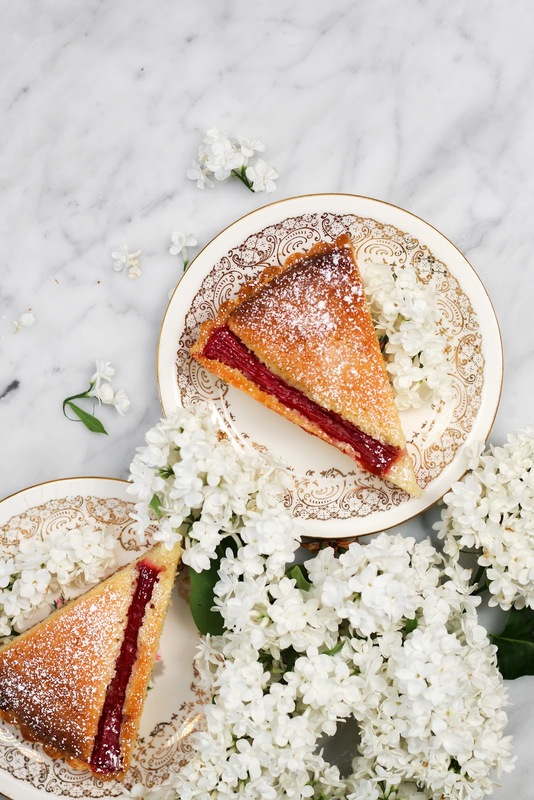 The first week of the market took place during peak lilac season, and I bought more than enough bunches of purple lilacs to last several batches of lilac cupcakes and lilac layer cakes. The two weeks following was when everyone was selling the most beautiful stalks of rhubarb. I have never really worked with rhubarb in the past and never had much desire to do so, maybe a strawberry rhubarb pie once in a while. Seeing everyone's excitement about rhubarb at the market and so many bakers' rhubarb treats on their blog pushed me to get a few stalks to play with. Strawberry rhubarb compote was the first thing to result from the vibrant red stalks and I have been slathering that compote on everything. 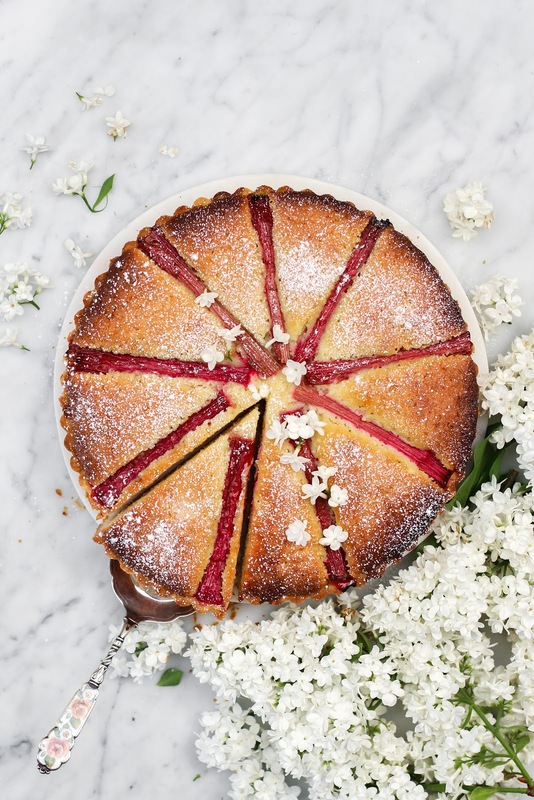 Putting it on toast, piping it inside cupcakes, and now baking it inside a tart filled with almond frangipane and topped with even more rhubarb. 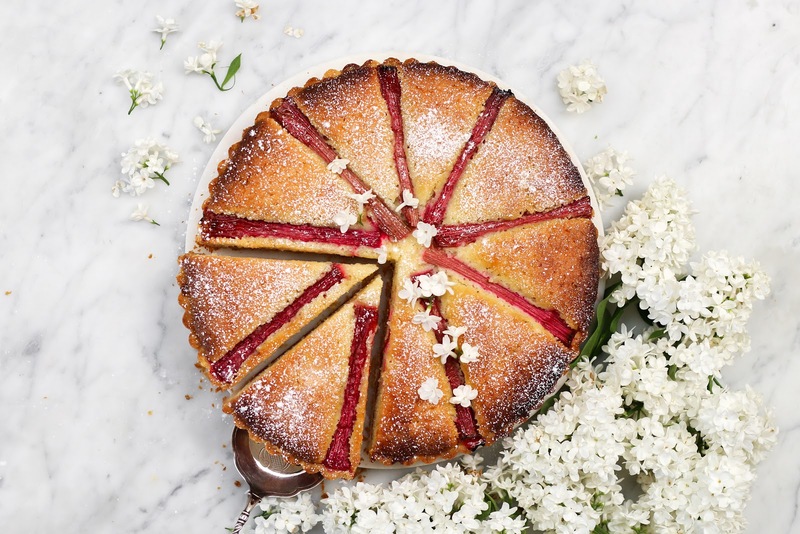 This Rhubarb Bakewell Tart is everything I wanted it to be. 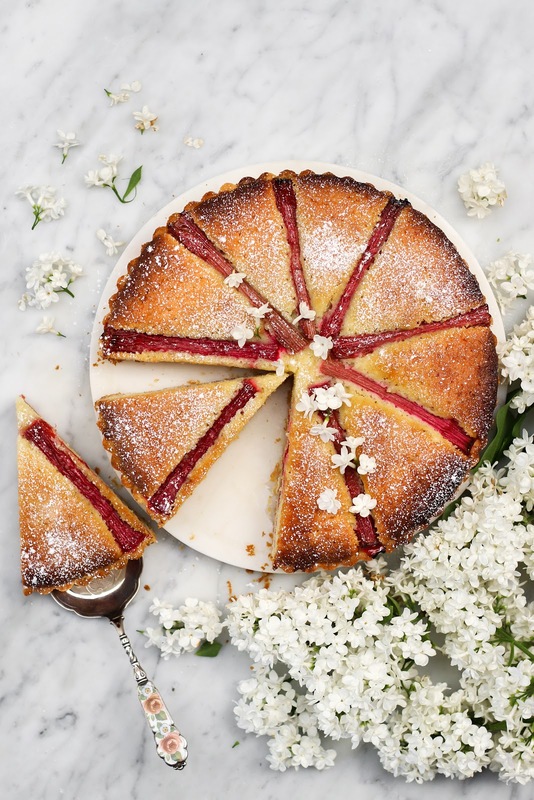 A sandy and buttery crust, a sweet and tart strawberry rhubarb compote layer, and a fluffy frangipane layer which has some textural similarities to cake. It is topped with more roasted rhubarb because 'tis the season. Serve warm as is or alongside a large dollop of vanilla bean-flecked whipped cream. With the mixer on low speed, beat in the salt and flour just until the dough comes together and there is no more visible flour. Careful not to over-mix. Remove dough from the bowl and press the dough into the tart pan, making sure it is evenly distributed. 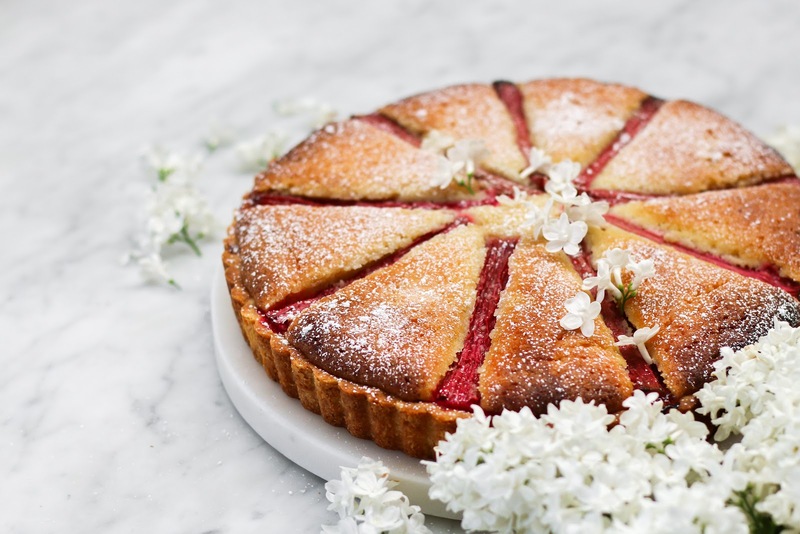 Using a fork, prick the bottom of the tart shell to prevent the bottom from puffing up when baking. Bake the tart shell at 400F until the crust is golden, approximately 10 minutes. You do not want the shell to be too brown. Remove carefully from oven and let rest on a wire rack. In a heavy medium saucepan over medium heat, melt the butter. When the butter has melted, add the remaining ingredients to the pan. Allow to cook, undisturbed, for 2 minutes. Gently stir and continue to cook, stirring occasionally, until the rhubarb is tender and juices become thick (10 to 15 minutes). Remove from heat and let compote cool. Beat together sugar and butter until creamy. Add eggs, one at a time, and mix until well-incorporated. Add vanilla. In a separate bowl, whisk together ground almonds, flour, baking powder, and salt. Add dry mixture to butter-sugar mixture and mix until combined. 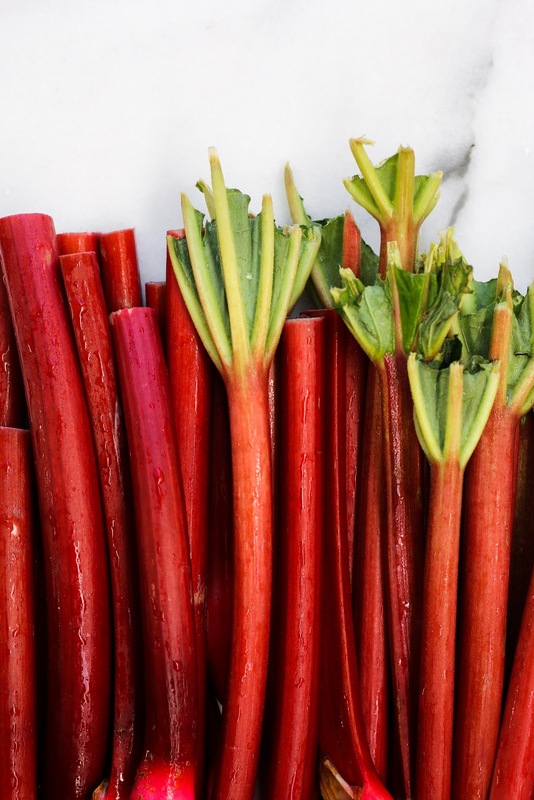 In a large bowl, toss together rhubarb, sugar, and vanilla. Set aside for 15 minutes. Transfer mixture to a parchment lined baking tray and bake for 20 minutes, until rhubarb is tender to the fork. Remove from oven and let rhubarb cool. Evenly spread compote on cooked tart shell. 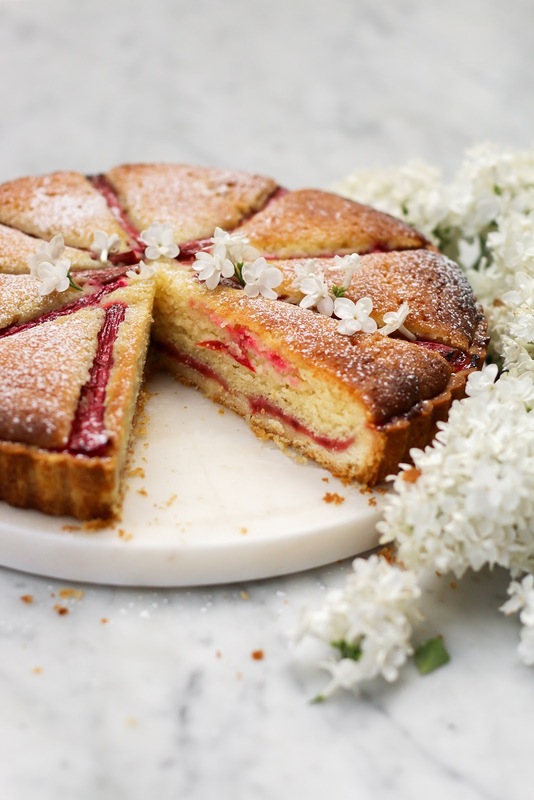 Carefully spoon the almond frangipane mixture on top of rhubarb compote layer. Even out layer with the back of a spoon or an offset spatula. Place stalks of rhubarb in a radial pattern on top of almond filling. Bake tart for 40 - 45 minutes until tart is golden. Let tart cool in tart pan for 15 minutes before carefully removing.